Women still make up fewer than 20% of councillors and just 5% of mayors worldwide, but the signs are that a new generation of women leaders is emerging at local level, just as the global urban population is set to explode. In this new urban world, local and regional governments call for cities created by and for women and girls at Habitat III [Tweet this ]. There has never been a more exciting time in terms of women's leadership at local level across the world. In Europe, cities such as Paris, Rome, Barcelona and Bucharest now have women mayors in office for the first time. In Africa, the network of elected local women, REFELA, is celebrating its fifth anniversary and going from strength to strength. In India, women have taken the helm in the state governments of Jharkhand, Goa and Puducherry. In Japan, Tokyo has recently elected its first woman governor, Yuriko Koike. In the USA, its capital city, Washington D.C., is currently led by its second African American woman mayor, Muriel Bowser, and in Latin America, women mayors are consolidating their leadership and implementing agendas to transform the lives of their citizens. But it isn't enough to have women in elected office. All women and girls in our cities and territories must be empowered to participate in economic, cultural and political life [Tweet this]. Female empowerment is both a goal and a means of sustainable urban development. Integrating a gender perspective into all local policymaking is essential to the achievement of SDG 5 and the New Urban Agenda. 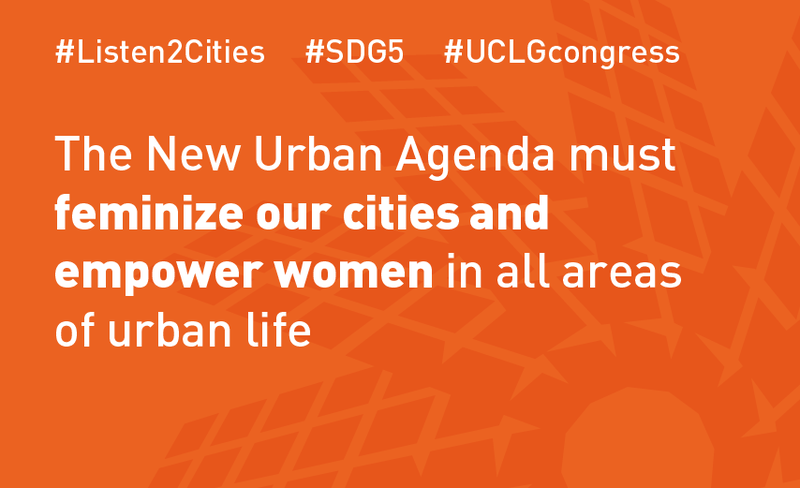 "Women, Leadership and Development: from SDG5 to Habitat III"
If you agree that the New Urban Agenda must feminize our cities and empower women in all areas of urban life [Tweet this], join the conversation on Twitter using the hashtags #SDG5, #UCLGCongress and #Habitat3. On 14 October 2016, some of the world's foremost locally elected women leaders will gather at the UCLG World Congress in Bogota to share the unique challenges and experiencies of female leadership in our cities. At the session, organized by the UCLG Standing Committee for Gender Equality, the mayors will discuss their policy priorities for the coming 3 years and the partnerships necessary to implement the New Urban Agenda with a strong gender perspective. Confirmed speakers include Mayor of Madrid, Manuela Carmena, Mayor of Bangangté and President of REFELA Celestine Ketcha Courtès, Mayor of Tevragh Zeina, Fatimetou Abdel Malick, and Raisa Banfield, Deputy Mayor of Panamá. Tweet using the HT #SDG5 and #Habitat3 if you agree that we need more locally elected women and gender equality policies in our cities! @SafetipinApp @uclg_women Agreed. I was trying to think of what ideas are there that make a city more gender inclusive.